Broadway In Chicago announced the national tour of CATS, the record-breaking musical spectacular by Andrew Lloyd Webber that has captivated audiences in over 30 countries and 15 languages, will play Broadway In Chicago's Oriental Theatre (24 W. Randolph) for a limited engagement July 16 through August 4, 2019. CATS will be part of Broadway In Chicago's upcoming season. Subscriptions will go on sale in the fall of 2018. CATS will join the line-up of performances at the annual Broadway In Chicago Summer Concert, sponsored by ABC 7 Chicago and hosted by Janet Davies, ABC 7 Chicago's entertainment reporter and host of the entertainment and lifestyle program 190 NORTH on ABC 7. The Broadway In Chicago Summer Concert will take place on Monday, August 13, 2018 at 6:15 p.m. at the Jay Pritzker Pavilion at Millennium Park (201 E Randolph St). Audiences and critics alike are rediscovering this beloved musical with breathtaking music, including one of the most treasured songs in musical theater-"Memory". 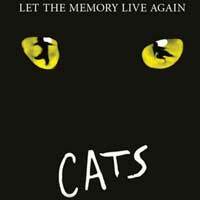 Winner of 7 Tony Awards including BEST MUSICAL, CATS tells the story of one magical night when an extraordinary tribe of cats gathers for its annual ball to rejoice and decide which cat will be reborn. The original score by Andrew Lloyd Webber (Phantom, School of Rock, Sunset Boulevard), original scenic and costume design by John Napier (Les Miserables), all-new lighting design by Natasha Katz (Aladdin), all-new sound design by Mick Potter, new choreography by Andy Blankenbuehler (Hamilton) based on the original choreography by Gillian Lynne (Phantom) and direction by Trevor Nunn (Les Miserables) make this production a new CATS for a new generation!